The Version 5.4 release of Wild Apricot consists of the following changes, enhancements, and bug fixes. 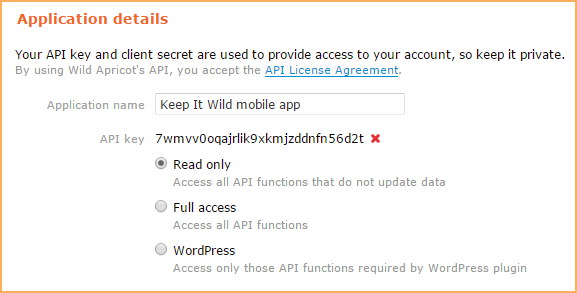 Instead of generating an API key to provide full access to your entire account, Wild Apricot now requires you to authorize individual applications to access your Wild Apricot account. This is a more secure approach since it allows you to limit access differently for different applications. If you've previously generated an API key for your account – prior to the 5.4 release – it will automatically be converted to an authorized application called Legacy API key. While authorizing an external application, you can now limit the API key to providing access to read-only functions. For more information, see Authorizing external applications. Wild Apricot is changing the authentication process for version 2 of its API from account authentication to the more secure application-based authorization. Instead of generating a single API key that provides complete access to your entire Wild Apricot account, you authorize individual applications, each of which are assigned separate credentials. If you are currently using an API key to authenticate your application, you can continue to do so, and no code changes are required. If you are using Wild Apricot account credentials to authenticate your application, you must change the authorization header of your authentication token request. Specifically, you must, within the authorization header, set username to the client ID assigned to your application when you authorized it, and set password to the client secret assigned to your application. Currently, username is set to the application name and password is set to open_wa_api_client (a constant). You must make this change by August 5, 2015 , the date that the account authentication method will stop functioning. As well, Wild Apricot is changing the possible scope values when restricting access using Wild Apricot's API. This is necessary to support the ability to restrict API key access to read-only functions. One of the new scopes – auto – will automatically detect the maximum allowed scope using the API key access level or the user's Wild Apricot account permissions, depending on which was used when requesting an authentication token. No code changes will be required because of this change as newly obsolete scopes will be automatically substituted by the corresponding new scope. Facebook is dropping its Like box plugin in favor of a new Facebook Page plugin on June 23rd. Consequently, we will be automatically – and immediately – switching all Facebook Like box gadgets on all Wild Apricot sites to a new Facebook page gadget. Your settings will be automatically migrated to the new gadget. You can now add member-only content from your Wild Apricot site into your WordPress site, and provide a single logon that authenticates Wild Apricot members and logs them into both their Wild Apricot and WordPress accounts. Using the Wild Apricot Login plugin for WordPress, you can also restrict content on your WordPress to your Wild Apricot members, in addition to providing access to restricted Wild Apricot content such as member directories and member-only events. 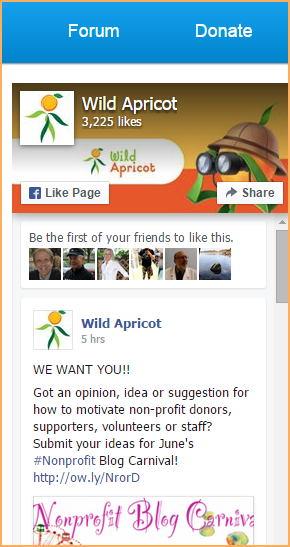 Any restricted Wild Apricot content – embedded using Wild Apricot widgets – can be accessed without further authentication. WordPress plugins are only available for WordPress.org users, and not for WordPress.com users. You can display a login button for single sign-on by adding a WordPress widget – installed along with the Wild Apricot Login plugin – to the header in your WordPress theme layout, or by inserting a shortcode in your WordPress page content. A shortcode can also be added to a WordPress page to restrict WordPress content to Wild Apricot members. For more information, see Integrating with WordPress. Using Wild Apricot's single sign-on service, you can integrate an external site – like your Joomla or Drupal site – with your Wild Apricot site. With single sign-on implemented, your members can log into both sites using their Wild Apricot credentials, and content on your external site can be restricted to Wild Apricot members. You can now control line height or line spacing (aka leading) – the vertical space between lines within a paragraph. 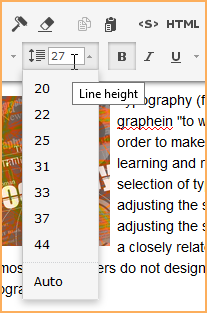 You can set the line height separately for each paragraph, or change the line height for multiple paragraphs. Another fully responsive theme set – Homestead – has been added. The Homestead theme set was designed with home building associations in mind, but can be used by any type of organization, particularly if you want to take advantage of its responsiveness and its theme-specific functionality.